When and How Did Super Soaker Get "Nerfed"? :: :: iSoaker.com ::: iSoaker.com | The Armoury | Information | Tech / Repairs :: Article Listing - When and How Did Super Soaker Get "Nerfed"? Back in the mid-1990s, when the internet was young and water warfare was a much more common occurrence during the spring and summer months, there really was one and only one world-reknowned brand of water blaster: Super Soaker. Possessing a model of Super Soaker pretty much ensured that you were packing the biggest and best water blasterthat money could buy; your opponents had better hoped they, too, were wielding Super Soaker water blasters, otherwise they would feel the difference, ending up punished by being on the receiving side of blast after blast of cool, crisp water. Beginning with the now classic Super Soaker 50, the Super Soaker brand, introduced to the world by Larami Corp., became a household name within a season. (See: Super Soaker History for a deeper look at Super Soaker's development). Year after year, consumers found themselves seeing a continued improvement both in terms of performance and capacity as well as overall quality and strength of the water blaster design. Well-admired blasters from the Super Soaker XP150 to the legendary Super Soaker CPS 2000 to the solid, lighter, yet powerful form seen in the Super Soaker CPS 1000 proved time and time again that the Super Soaker brand well deserved of its name and those wielding these blasters could, indeed, give their opponents a "super soaking"! Now, this isn't to say that there were never any duds in the Super Soaker line-up. Water blaster models like the Super Soaker XP85: Triple Shot and the Super Soaker XP 90: Pulse Fire didn't quite pack the punch for their size that other Super Soaker models did, receiving a decent amount of mocking in online forums. However, these aberrations were still accepted to some degree as experiments and, with so many other solidly performing models on the market, few really worried much as the rest of the blasters available seemed to keep getting better. Things, unfortunately, did not continue that way. By the year 2000, the maximum power for stock water blasters appeared to have been achieved. Actually, some argue that it had been achieved 4 years prior with the release of the Super Soaker CPS 2000 and its massively powerful drenching stream. What people found out in 2000 was that though the Super Soaker line now featured the largest beast of a water blaster, the Super Soaker Monster XL, which was bigger and meaner-looking than anything it had made previously (even being featured in the Guiness Book of World Records), this monstrous water blaster seemed to lack the punch that older CPS-named models possessed. However, this was only the beginning of the tipping point. In 1996, the Super Soaker CPS 2000 redefined the stock water blaster landscape perhaps beaten only by the original Super Soaker 50's effect on water warfare. For those less familiar with the technology different, early Super Soaker models used air pressure to provide the power needed to produce the constant water streams the various water blaster models could produce. While better and more effective than the motorized water blasters of the day, the limitation of air pressure technology is that blasters cannot be fired at any angle; as water naturally moves to the bottom, holding a water blaster vertically or even upside-down would result in the undesired "mist-shot" when, instead of shooting water, one's water blaster would expel its pressurized air and lose its ability to shoot again without significant re-pumping. Constant pressure system (CPS) technology, unlike air pressure systems, uses rubber chambers that expand when filled with water; the stretched chamber provides the pressure to push water out of the nozzles. Not only does this eliminate the misting shot problem, but unlike the air pressure systems, the pressure applied to the stream in a CPS blaster remains fairly constant throughout the duration of the shot, resulting in significantly better stream performance. As most CPS-based blasters featured larger diameter tubing, good sizes pressure chambers, and plenty of reservoir space, the overall package made CPS-based blasters perform significantly better than any air-pressure-based water blaster. To many water blaster enthusiasts, the CPS technology represents the current pinnacle of stock water blaster performance. 1996 was the inaugural year for CPS tech, but the flexibility of the system could be seen in the 1998 Super Soaker line featuring lighter CPS-class blasters like the Super Soaker CPS 1000 as well as the high capacity Super Soaker CPS 3000. The 2000 Super Soaker line offered a re-styling of the 1998 Super Soaker CPS models, but the general size formats remained the same. Together with the CPS-based Monster line-up, the year 2000 featured the most number of CPS-tech water blasters. Sadly, this has not yet since been repeated. There are some reports that the Super Soaker Monster XL had to be tested for safety reasons and, while it passed the tests, it was deemed to be the most powerful a stock water blaster could be before the risk of permanent eye damage assuming a point-blank shot into someone's eye occurred. Given how readily companies were sued over other questionable uses of otherwise safe products, this may have played a part into the decision to apparently scale back the top level of power for future Super Soaker water blasters. 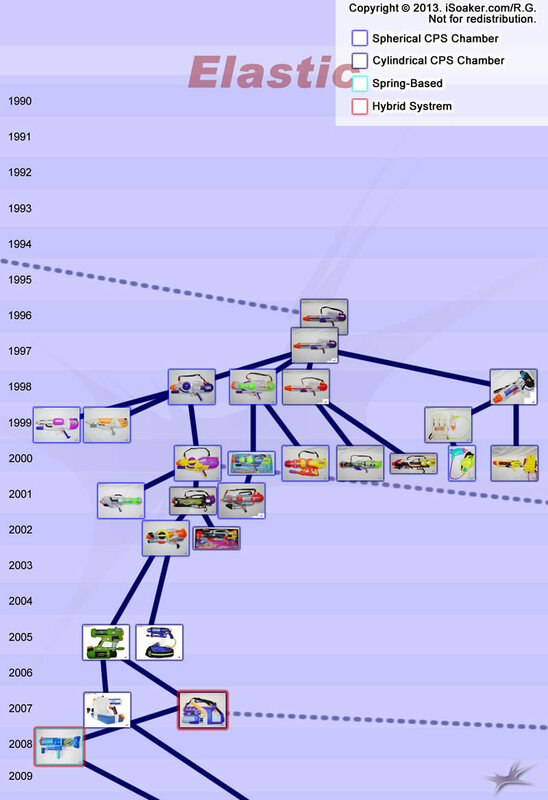 A look at the Super Soaker Elastic Series Evolution Tree shows the history of blaster releases. In 2001, three new CPS-based blasters were released, but none attempted to be as large or as powerful as the Super Soaker CPS 2000 or Super Soaker Monster XL. In 2002, there was only one new design in the CPS category, the Super Soaker CPS2100 (the Super Soaker CPS 4100 is considered as a Super Soaker Monster (2001) minus its fast-fill capability, hence, not a new design; merely a stripped down one). After 2002, no new CPS-based blasters appeared for 3 more years. While Larami Corp. brought the world the Super Soaker back in 1991, few took much notice when Larami Corp. became Larami Ltd. in 1995 when it became a subsidiary of Hasbro Inc. At the time, for those that knew, the acquisition appeared to be a great thing in that the Super Soaker design continued to evolve and improve, but could then leverage Hasbro Inc.'s wider distribution network to make Super Soaker water blasters available on a larger scale. What most didn't realize was that this 5 year deal (that actually lasted 7 years) ended with the eventual dissolving of the original Larami team responsible for developing the Super Soaker once Hasbro Inc. completely took over in 2002. Blasters in 2003 no longer featured the familiar Larami logo, instead being replaced by the Hasbro Inc. copyright statement. 2003 was also the year of the Super Soaker EES series; whether this was a co-developed line or the first blasters developed wholly by Hasbro Inc. remains unclear. 2003 also welcomed the otherwise unnoticed launch of the Water Warriors brand by a then unknown company called Buzz Bee Toys Inc. (See: Water Warriors Line History for more info); a company created by many of the former employees of Larami Corp./Ltd. Of course, changing who heads up the design team for a product line is not always a bad thing, but time would tell. In the next years post-Larami, the Super Soaker brand seemed to struggle somewhat. The 2003 Super Soaker EES series was mostly mocked by users. The largest blaster of 2004, the Super Soaker Triple Aggressor, was met with less-than-thrilling reviews for its bulky size yet mediocre performance and gimmicky features. It wasn't until 2005 when the Super Soaker line featured some new models that water blaster aficionados made note of, namely the Super Soaker Flash Flood and the Super Soaker Triple Shot. The Super Soaker Triple Shot was and is still perhaps the best pistol-class air pressure water blaster, featuring 3 nozzle settings for conservative blasting or serious drenching (though very quickly emptying one's reservoir). The Super Soaker Flash Flood was the first blaster in roughly 3 years that featured CPS-tech and provided a widely regarded "Flood" nozzle that proved great for close-range drenching. The CPS-based Super Soaker Aquapack Devastator also appeared, though its performance was a far cry from a blaster such as the Super Soaker CPS 1000. Those familiar with the CPS lines of 1998 and 2000 were less impressed, but did give these blasters credit where due, hoping their release signified the return of more CPS-class blasters. 2007 once again made people yearn for the return of more CPS-class blasters, with Hasbro Inc. releasing the Super Soaker Arctic Blast and Super Soaker Hydro Blitz to the line. While the Super Soaker Arctic Blast was more-or-less a re-styled Super Soaker Flash Flood, the larger, heavier Super Soaker Hydro Blitz appeared to be Hasbro's attempt at releasing truly larger CPS-blaster again. Unfortunately, the Super Soaker Hydro Blitz performed much worse than what its internals should have allowed it to. Instead of pushing out a nice, thick solid stream, the larger of the Super Soaker Hydro Blitz's CPS chambers is used to either directly power a rather small nozzle or to pressurize a smaller CPS-chamber which then powers its "Blitz" nozzle; this sort of energy transfer is always inefficient, thus the true power of the main CPS-chamber ends up going to waste. Moreover, there's the inefficient layout of internal tubing which further reduces flow rates from the chamber (water has to do a full 180-degree turn to exit the stream nozzle). On top of that, the overall blaster design is poorly balanced with a top-handle-based pumping mechanism that is awkward to use and rear-positioned trigger which is ill-positioned for such a heavy water blaster. There just was no good way to use this blaster without feeling rather awkward; even carrying it without pumping or shooting was uncomfortable. After 2007, there was another lull in the appearance of CPS-tech-based water blasters. 2008: No New Air-Pressure-Based Blasters - The End of "Super Soaker"
2008 marked the first year that the Super Soaker line had no new products that made use of the pressurized air technology that made them so successful in the first place. There also were no new CPS-based blasters released, instead having only one pump-action and one spring-based pump-action blaster appearing, neither of which were particularly potent in terms of water power. In 2009, there was only one addition to the Super Soaker line, the Super Soaker 50 - 20th Anniversary Edition. As a tribute to the original Super Soaker 50, the Super Soaker 50 - 20th Anniversary Edition featured a fixed reservoir with a screw cap as opposed to the removable bottle-type reservoir found on the original. While structurally stronger, performance is similar and many wondered what happened to all the improvements that had occurred over the previous 20 years. Had the line finally come full-circle? 2009 was the disappearance of the "Super Soaker" brand, replaced now with "Nerf Super Soaker"; Super Soaker gets officially "Nerf"-ed. Borrowing heavily from the stylistic elements found in Nerf dart guns, the new Nerf Super Soaker line brought a more technical, serious look to the water blaster line. The Nerf Super Soaker Shot Blast, Nerf Super Soaker Rattler, Nerf Super Soaker Bottle Blitz, and Nerf Super Soaker Hydro Fury all featured Nerf-like styling and came in red or blue team colors, promoting the general concept of team colors for water warfare. While looking great, the performance of these newest water blaster models left much to be desired. The only pressurized blaster in the new line was the pistol-sized Nerf Super Soaker Hydro Fury while the larger Nerf Super Soaker Shot Blast performed more-or-less like a semi-delayed pump-action water blaster and could not provide the drenching capabilities as seen in older Super Soaker models. In 2011, Hasbro Inc. teased fans with the release of a new CPS-based water blaster, the Nerf Super Soaker Hydro Cannon. The size and shape of the Nerf Super Soaker Hydro Cannon brought back memories of the legendary Super Soaker CPS 2000, and the Nerf Super Soaker Hydro Cannon's massive nozzle appeared it just might perform as well. However, testing of this large blaster placed the Nerf Super Soaker Hydro Cannon more closer in performance to the "Flood" setting on the smaller Super Soaker Flash Flood as opposed to any of the CPS-class blasters from 1996-2000. In fact, it turned out that the Super Soaker Flash Flood has better stats overall than the Nerf Super Soaker Hydro Cannon despite being much more compact and easier to use. On top of that, the Nerf Super Soaker line introduced the first motorized water blaster, the Nerf Super Soaker Thunderstorm while its only air-pressure-based model was the pistol-sized Nerf Super Soaker Point Break (a.k.a. High Tide in some countries). This is particularly ironic as it was the original Super Soaker which spelled the end of the reign of the motorized water blaster in the early 1990s. 20 years later, one would have hoped that a blaster bearing the "Super Soaker" name should be revolutionary when it comes to soaking technology, the Nerf Super Soaker Thunderstorm really seemed to be performing only on par with the water blasters the Super Soaker made obsolete. It even still required 4 AA batteries to power the motor, akin to the Entertech water guns from the 1980s. The 2012 line of Nerf Super Soaker blasters merely poured more salt into the wound. Not only were no new pressurized water blasters added to the line, but two more motorized water blasters (Nerf Super Soaker Lightningstorm and Nerf Super Soaker Electrostorm) were added as well as a small pump-action water blaster, the Nerf Super Soaker Micro Burst. The Nerf Super Soaker Lightningstorm proved to be merely the Nerf Super Soaker Thunderstorm with a shoulder stock, shield, and larger reservoir tacked on while the small Nerf Super Soaker Electrostorm offered less capacity and output, through still requiring 4 AA batteries to work. The 2013 line of Nerf Super Soaker blasters appears to continue the trend of sacrificing performance for styling. While some advances have been made with respect to water capacity issues, Nerf Super Soaker average blaster performance is a far cry from the golden years in the late 1990s. The newest models in the 2013 Nerf Super Soaker line-up appears comprised of pump-action-based water blasters and one, small pistol-sized spring-loaded water blaster. Initial tests with the new Nerf Super Soaker Arctic Shock also highlight some problems with the use of the clip system combined with pump-action blasters (review coming soon). See also: Diving into water blaster statistics (2012): Part 5 – Soaking through the Years for an objective look at water blaster trends over the years. 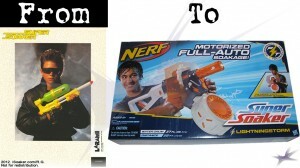 Looking beyond the loss of original design and engineering talent that occurred when Hasbro Inc. opted to dissolve the group from Larami who helped originally develop the Super Soaker, the most apparent loss of direction appeared when the Super Soaker brand was brought under the Nerf banner. While attaching "Nerf" to the Super Soaker name seemed to make sense since Nerf brand's popularity has increased significantly over the years, the biggest mistake made was apparently trying to force the Nerf Super Soaker water blaster design to fall in-line with Nerf gun dimensions. Water blasters generally need to be bigger than foam dart blasters for the simple fact that water is heavier and more difficult to push than darts. The typical Nerf foam dart weighs in just around 1g. I'd be surprised if the large foam arrows weigh much more than 30g. As 1mL of water weighs 1g, a blaster pushing out a 1x stream (30mL/sec) is basically doing as much work as a Nerf dart gun firing off 30 darts per second. And, to a serious water warrior, a mere 30mL/sec output feels weak for a water blaster. Though "Super Soaker" may be under the Nerf banner, this should not mean that Nerf Super Soakers must be limited to Nerf Dart Gun dimensions and sizing ratios. As Nerf dart guns and Nerf Super Soakers use rather different forms of ammunition, the blasters which do so should be made optimally to yield the best performance for their respective form of ammo. The Nerf Super Soaker blaster could definitely be made in the same spirit and general styling of the overall Nerf line, but be more substantial in order to house the parts necessary to create a good performing water blaster, namely larger pressure chambers, reservoirs, larger diameter tubing, etc. On top of this, while motorized water blasters can remain part of the line, Nerf Super Soakers should make use of the technology and patents they are sitting on, namely for air pressure and CPS-tech-based water blasters. Here's for hoping that those responsible for the Nerf Super Soaker brand come to realize that the recent products under their flag are a far cry from what the "Super Soaker" brand ought to be. The recipe for more potent water blasters is available; it is now a matter of getting them to again make use of technologies that made "Super Soaker" a household name.